The new sports collectibles reality show, Ball Boys, debuted this past weekend. It was instantly and infinitely more likable than the recent attempt, All-Star Dealers, which featured Grey Flannel Auctions. Ball Boys is modeled after the critically acclaimed and widely successful Pawn Stars. Seeing as how both shows are produced by the same company, Left Field Pictures, it’s easy to see why the formula is being replicated for a show exclusively focused on sports memorabilia. Ball Boys is centered on the daily lives of long-time sports memorabilia retailers Robin (Robbie) Davis Sr. and his son Robin (Rob) Davis Jr. They run Robbie’s First Base in Baltimore, Maryland. 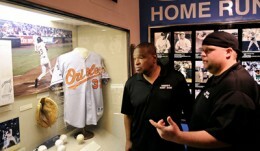 The store has a variety of collectors and local athletes, including former Baltimore Oriole Al Bumbry, who is actually a co-owner in the venture. The most addictive part of the show is wondering what will come in next. The the show also capitalizes on the proven hook of focusing on boisterous personalities. Robbie and his son can argue about sports all day long but their generational differences usually mean there is never a clear-cut winner. The father and son are helped by two other employees: Shaggy and Sweet Lou. Shaggy plays the role of educated, fact-filled peacemaker while Sweet Lou is a lot like Chumlee from Pawn Stars. All-Star Dealers provides a narrator-read story and focuses more on the often boring transactional aspect of memorabilia. Ball Boys goes more into an item's back-story and provenance using first-person accounts. This allows the audience to become engrossed in the item's history. Only then are the crucial aspects of authenticity and negotiation are shown. When it came time to authenticate a full-size Cleveland Browns helmet autographed by Jim Brown, what better way to do so than to have the Hall of Famer himself look at the signature? The awe on the faces of the customers who brought the item in was priceless. The fan and celebrity interaction created a human interest story that transcended the sale of a signed football helmet. Despite its strip mall location, Robbie’s comes off more like a sports bar where you can buy what’s hanging on the walls. It's more than what collectors might regard as a typical card shop. While there were boxes of cards seen on the sales floor, they were sparing at best. At no point in either of the series two opening episodes was there anytime dedicated to trading cards. That’s not to say that sports collectibles ephemera were entirely ignored over the sexier sports collectibles items like game-used jerseys and autographed pieces. In fact, the show opened with a scorecard from the 1920s signed by members of the New York Yankees' legendary Murderers Row, including Tony Lazzeri, Lou Gehrig, and Babe Ruth. Ball Boys has an honest chance to succeed. It will be interesting to see the character development and team chemistry progress as the series continues. Ball Boys airs on Saturdays at 3PM EST with back-to-back episodes on ABC. did not like it. Just a little too plotted it felt like.